Flight anxiety and anticipatory anxiety are different. We broke the code of flight anxiety years ago. For years now, we have been able to help anyone and everyone fly without high anxiety or panic. When a person has learned and practiced the Strengthening Exercise, he or she will be able to fly without high anxiety or panic. Feelings will be automatically controlled. But anticipatory anxiety can still be troublesome. It is so easy for a person to think the Strengthening Exercise will not work. They have anticipatory anxiety that the flight will be awful. These thought trigger the release of stress hormones. The hormones cause feelings of anxiety. These feelings can lead to doubt about whether or not the Strengthening Exercise will work, it will. Anticipatory anxiety does not mean there will be anxiety on the flight. It’s more than one thing. If we focus on just one part of the anticipatory anxiety problem, we may get only partial relief. So let’s look at all the possible causes. 1. The Belief That Being Relaxed – Instead Of Being On Guard – Tempts Fate. It’s interesting how fear of not being fearful develops. It begins with the first trauma in your life. Until that moment, you didn’t know something so awful could happen. The feeling of being safe and secure is shattered. You don’t know how to go on knowing that something awful could happen at any moment. It could happen just as unexpectedly again. What can you do? You begin to expect it. By expecting it, you are — sort of — braced for it. You decide to always “look to the blue”, anxious at every moment. If nothing awful happens for a while, you may begin to believe expecting bad things keeps them from happening. Fast forward to adulthood. You learn more about what makes flying so amazingly safe. You learn about simulator training, backup systems, etc. You realize, as your flight approaches, that you are not anxious. Suddenly, anxiety hits. Is not being anxious is a safe thing to do? Will letting your guard down cause something awful to happen? Even as an adult, giving up a strategy that might have magically protected you all this time isn’t easy. Our first trauma happened when we were young when our ability to use logic was limited. This faulty belief is based on the best logic available to us at the time. Yet, the belief persists, and continues to dominate us, because we have not examined the logic upon which that belief was founded. Until we do, we will continue to feel greater anxiety when starting to feel confident about flying. Whenever we notice we are NOT having anticipatory anxiety, THAT can worry us. So we keep it going. 2. Doubt That The Course Will Work? The Strengthening Exercise will work. It is as simple as that. If you went to the supermarket and took the label off a can of cat food and pasted it on a can of tuna, when you check out, as that can goes by the scanner, what is the scanner going to say: “Cat Food; fifty cents” no matter what is in the can. What else CAN the scanner say? All it does is look at the bar code. We have a device like that in the brain. It’s called the amygdala. That’s the part of the brain that causes us to feel anxiety. It causes us to feel anxiety be releasing adrenalin into the brain and the body. How does it know when to do this? Well, the amygdala isn’t very smart. It doesn’t do any thinking at all. Just like the scanner at the supermarket does NOT look inside the can to see what is there, the amygdala does not look at the thought. It just reads the label. If your flying thoughts are labeled “danger”, that is what the amygdala reads. When it reads that, it releases the adrenalin which “revs” you up. Too many thoughts with too may danger labels will cause too much adrenalin and result in high anxiety or even panic. All we need to do to stop that is change the labels on your flying thoughts. Then, the amygdala lets thoughts about flying go by without setting off any alarms. Once you have done proper practice of the Strengthening Exercise, the amygdala is going to read the labels on flying thoughts as “no big deal.” You are just NOT going to have a problem during the flight. Just as sure as the scanner at the supermarket is going to register that re-labeled can as cat food, the scanner in your mind is going to register re-labeled flying thoughts as no big deal. Keep in mind, to make the Strengthening Exercise work, you have to do your homework. Every thought has to be relabeled. It takes a few practice sessions to make the new labels stick. Once you have done proper practice, there is no way to have high anxiety or panic on the flight. 3. If I Have This Much Anxiety Now, Maybe I’ll Have More On The Flight. It doesn’t work that way. Once you have done the preparation with the Strengthening Exercise, the anxiety you get on the flight is less than the anxiety you get in anticipation. This means, the amount of anxiety you are getting in anticipation is NOT indicative of the amount of anxiety you will get during the flight. What goes on in advance of the flight is worse than what goes on during the flight. Then, after you have done a few flights, and know from your own experience the Strengthening Exercise prevents high anxiety and panic, you don’t need to have anxiety about anxiety. Re-label the flying thoughts and the anxiety will not come. 4. Stepping Into The Unknown. We know we don’t know the outcome of the flight in advance. Anticipatory anxiety depends, in part, on what we expect. You’ve driving your car hundreds if not thousands of times. You have gotten good results; when you get in your car that’s what you expect. Every time you drive 5.4 urban miles, that is equal in risk of fatality to a trip from New York to Tokyo. Think how many times you have driving 5.4 miles. That’s how many flights you could have taken with the same risk. Driving worked out OK. So why not flying? Based on experience with driving, you expect good results. Based on experience flying, pilots expect good results. Pilots fly day in and day out. Year in and year old. And nothing happens. It’s boring. Our friends who are pilots fly day in and day out, year in and year out, and nothing happens to them either. I flew for Pan Am and United for thirty years. I know literally hundreds of pilots and hundreds of flight attendants, and I know no one who every got even scratched in an accident. 5. Thinking There Is No Way Out. There is a dolphin show at the aquarium in Mystic CT. When I saw the show, the trainer told us the most difficult trick to get a dolphin to do is to jump through a hula hoop. Why? Dolphins are air-breathing mammals, and, they can’t swim backwards. If a dolphin is encircled in a tight space, it will drown. It’s brain is genetically wired to tell it never to be completely encircled by anything. Even a harmless hula hoop violates the genetic coding in a dolphin. Like the dolphin, we – too – perhaps by nature – want to have a way out. We look at flying like the dolphin looks at a hula hoop. With flying, though it LOOKS – visually – like there is no way out, there is an ENGINEERING way out. Since you can’t SEE the engineering ways out, you need to imagine them. You need to know, as a pilot knows – that for everything that we know of that could ever go wrong, there is a backup system, and a backup for that. Though we don’t have a way out that you can see with your eye, there is always a way out you can see in your mind’s eye. Picture the pilot’s manual. We have been flying airplanes for over one hundred years. Whenever there has been an accident, the cause has been investigated, and something has been done to make sure that can’t happen again. That means, for something to go wrong these days, it has to be something that hasn’t happened in one hundred years of aviation. That’s why accidents are so incredibly rare. It is because we have ENGINEERING ways out. All the engineering ways out are in the manual. Picture this. In a car, if someone comes at you, you turn the wheel. In an airplane, if something goes wrong, you turn to the manual. Anything that can go wrong is in the manual. Pilots feel in control, not just because they have the wheel in their hands, but because they have a way out for everything that anyone can foresee ever going wrong. 6. What About The Pilot? If a doctor makes a serious mistake, the patient may not survive. But the doctor does continues to practice. If a lawyer makes a serious mistake, the client may go to jail, but the lawyer doesn’t. The lawyer continues to practice. If a pilot makes a serious mistake, does he or she get to continue to practice? No. If a pilot makes a serious mistake, he or she is six feet under. So, if you want to know whether a doctor or a lawyer is good or not, you ask about their reputation. But if you want to know whether a pilot is good or not, you just have to notice whether you can see the pilot, or not. If you can see the pilot, you know he or she is a good one. The ones who weren’t good are six feet under. It takes a professional board to stop an incompetent doctor or lawyer. You can’t always depend on professional boards to do the right thing. But you can depend on gravity. It doesn’t take a professional board to stop an incompetent pilot. Gravity will do it. It takes years of flying before any established airline will consider a pilot’s job application. The airlines want to be sure pilots have been well-tested by gravity before letting them fly an airliner. So the answer to your question about does the pilot know what he or she is doing? If you can see the pilot, you know the pilot is a good one. When you fly, board early. Ask a flight attendant to go up to the cockpit and ask the captain if you can come in and say hello. 7. When Does Anticipatory Anxiety End? Anticipatory anxiety ends when the biggest thing causing anticipatory anxiety ends . . . anxiety about the wisdom of giving up control to another person. Some of us find it really hard to give up control. I don’t think we wired up that way at birth. Instead, I think distrust comes from experiences where others betrayed our trust, and did not act in our best interest. Mark Twain said, Once a cat jumps on a hot stove, it will never jump on a hot stove again . . . or a cold one. Once we have had experiences where our trust was betrayed, it is emotionally difficult to trust; it is difficult to give up control. Think of the times you have trusted someone with your life, or with your well-being, or with your heart, and been betrayed. We learn, many of us, that we must never trust. . . that what we must do is take care of ourselves and never ever put ourselves in the hands of others. And yet, all human relationships are about – to some extent – doing that. As tiny children, we are completely at the mercy of our parents, and those of us who didn’t have perfect experiences with our parents, naturally, have anxiety about trust. 8. The Flight Is Like An Arranged Marriage. It would be crazy NOT to have anticipatory anxiety. But it ends if you are the bride and the groom turns out to look like Brad Pitt! That is why anticipatory anxiety goes away when you meet the captain. You find our your captain is not a reckless maniac but a person you sense can be trusted completely. For anticipatory anxiety to go away, you need to get a gut level feeling about this person as being real, as being competent, and as caring that the plane gets there. You need to recognize that this captain has been doing this for years and can handle this job. He or she wants to get back to family and loved ones just as you do. Until you meet the captain, it is like just throwing all caution to the wind, like playing Russian Roulette, like taking an awful chance with your life. And if you feel you must do this, it would be crazy not to be anxious about it. But once you meet the captain, all that changes. Now you know this person cares as much about getting there safely as you do. And you know this person knows how to get you back to the ground safely. That is when anticipatory anxiety is over. At that point anticipatory anxiety is finished. The Strengthening Exercise which you learned and practiced now kicks in to deal with the flying part. So, when you have anticipatory anxiety, the thing that makes sense to do is just ignore it because there is nothing you can do about it. See, you are dealing with anxiety like what the outcome will be of marrying someone tomorrow at random, or of having an operation and having your life in the hands of someone you don’t even know. 9. A Strategy For Dealing With Anticipatory Anxiety. Since anticipatory anxiety won’t go away until you meet the captain, avoid it by not making the decision until you meet the captain. Go to the airport. Go to the boarding lounge. Get on the plane. Meet the captain, And THEN decide. Then decide if this feels right to you. How POSSIBLY could it feel right to you until then. How POSSIBLY could it feel right to marry someone you haven’t met. How POSSIBLY could it feel right to have surgery without meeting the doctor and talking it over with the doctor. So how POSSIBLY could it feel right to decide to fly with someone until you have met them. 10. An Advanced Strategy For Dealing With Anticipatory Anxiety. This is advanced; it is not for everybody. Let’s see if this is for you or not. The first concept I want to direct you to is the idea that the mind is not supposed to be at peace. Many people believe the goal is having no conflict. We are supposed to have conflict, and it is up to us to decide, moment-by-moment, considering the many conflicting ideas and impulses and desires we have, what to do. People who are mature are aware of their conflicts and make decisions based on their goals and priorities. People who are immature spend their time unproductively simply trying to avoid awareness of conflict. Anticipatory anxiety is about conflict: that’s pretty obvious when you think about it: the conflict is you want to fly and you don’t want to fly. How can you resolve the conflict? Consider: what is the very worst that can happen on your flight? Well, you could get on, the plane could take off, and climb up to cruise altitude and – though I can’t imagine how it would happen – I’m sure you can imagine the plane plunging, and you can imagine going through terror, with people screaming, and things flying around, and then . . . it’s over. You are dead. And while we are on the subject, it is not being dead that is so awful, . . . it is GETTING dead, going through that terror first. As someone posted on the message board, yes I know flying is hundreds of times safer than driving, but if I crash my car, it doesn’t fall 30,000 feet first. It is the terror that is the problem. Terror is the worst thing that can happen on your flight. Consider next: what’s the best it could be? You get on the plane, they upgrade you to first class. You find yourself sitting next to your favorite celebrity, and is delighted by your wit and charm. The plane takes off and you hardly notice it. Cruise is perfect – not a ripple. The plane glides down to touchdown as smooth as silk, and you get off, and actually find you luggage made it, too. You have considered the best and the worst. You could hope for a perfect flight: it isn’t going to happen. You could dread the worst flight from hell with terror and death; it isn’t going to happen. Neither of those is going to happen. You know that and I know that. It is – instead – going to be someplace in the middle, someplace between those extremes. There is only one question remaining: are you going to do it or not? Here is your opportunity to make the choice to fly, and further, to make that choice a commitment to fly . . . and here is the kicker . . . no matter what, even if it kills you. THAT, is the thing that makes all the difference . . . no matter what, even if it kills you . . . it is as certain – now – three days before your flight – that you will be in your seat on that plane when the door closes – as if you were on it right now. You will allow NOTHING to stop you from being on that plane when the door closes. You can take it to the bank. It is carved in stone . . . a done deal. Why? Because you say so. . . because you have made an irrevocable commitment to do that flight, no matter what. An amazing thing happens. That part of you that has been doing numbers on you to find some excuse, some way out, of taking that flight, gives up. Conflict disappears because one part of you gives up. You feel unified. You feel peace. Anxiety vanishes. For as long as that commitment – that unconditional commitment to fly no matter what -persists, anxiety cannot get a leg to stand on. But, as your flight gets closer, the commitment will lapse. Anxiety will come back. You will need to make the commitment again. But remember; paradox. You can’t DO this commitment thing to make anxiety go away. You make this commitment out of you own personal ability to make a commitment and keep it. Anxiety going away is only a by-product of your determination. If you try to commit in order to get relief, it won’t work. This commitment has to come out of the essence of who you are. Not everyone has that essence; as I said, . . . this is not for everyone. This is for people who have a sense of personal power, people who know they have the power to make things happen. You will need to search for the hidden strategies you may have to sneak out of the commitment. . . such as, Yes, I’ll do it no matter what, but if I don’t sleep well the night before then . . . no. That won’t work. Or, the weather doesn’t look good. Or, there was a crash on the news. Or there was something that might be an omen. Look for your secret “ways out”. Recognize them, and re-commit. Once again, this is not for everyone. If you are just looking for relief, it’s not for you. If you are really committed to personal grown, then APNR is for you. It anticipatory anxiety gets big, turn to the 5-4-3-2-1 for a break. Rationally, you know it is OK to fly. Emotionally, give yourself a 5-4-3-2-1 break and continue giving yourself 5-4-3-2-1 breaks until the anticipatory anxiety ends when you meet the captain. When considering an upcoming flight, a massive error is easily made without any awareness of error at all. It is natural to want to consider the flight. It is natural to wonder how we will feel. It is natural to think that even though we did fine our last flight, this one may be different and something may cause overwhelm. When trying to make an assessment of an upcoming flight, we try to imagine what the flight will be like. Though the flight duration may be hours, when we use imagination, we take all the things that we think could or would happen in those hours and jam every one of them into one moment of intense imagination. As a result, all the stress hormones that the flight would spread out over hours becomes concentrated into just one moment of anticipation. As a kid, I took the magnifying glass my grandmother used for reading out in the yard. It was a nice summer day. The sun felt good on my skin. But that sunshine, when focused by the magnifying glass onto a piece of paper, quickly burned a hole in the paper. The same thing happens with the intense focus caused by time compression. You take what would happen in hours and compress it into seconds. Emotionally, you get “burned”. It is the same as if I said to myself, “If I try to get a sun tan, my skin will catch on fire.” That is the mistake people make when they anticipate what a flight will be like and focus all the events of the entire flight into one intense moment of imagination. When you try to anticipate an upcoming flight, if you allow time compression to take place, your estimate of what will happen on the flight will be grossly inaccurate. 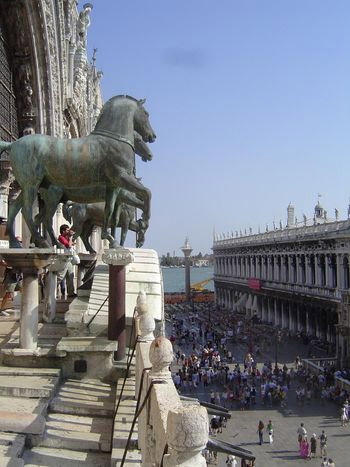 When I surveyed the view, I saw the plaza, the sidewalk cafes, the pigeons, people walking, more buildings at the far end, the rooftops of Venice, the harbor to the left, and another church on the other side of the harbor. I looked at these things one at a time. But I learned from my friend’s reaction — overwhelm — that while some take in such a view item by item, others take in all the items at once; and when all those items are taken in at once (rather than one by one) it is overwhelming. This can teach us a great deal about anticipatory anxiety. The ‘events’ (such as take off, climb, cruise, descent, and landing) that take place on a two-hour flight are spaced over two hours of time. Thus, if these events are experienced when they occur, they are experienced with several minutes of spacing between them. But when one ponders an upcoming one hour flight, one doesn’t take two hours to ponder the flight. Instead, the events of the two-hour flight are compressed into just a few seconds of time. Let’s imagine that each one of these five events causes a stress hormone release. The stress hormone from the first event is burned off before the second event takes place. And the stress hormone from the second event is burned off before the third even takes place. But when pondering an upcoming flight, the experience of each of these five events is compressed in time from an hour to just a few seconds. If each causes a stress hormone release, the five shots of stress hormone are released within a timespan — not of an hour but — of a few seconds and the result can be a high level of anxiety. Taking a flight is like eating a Big Mac. You do it bite by bite. You ‘process’ each bite separate from any other bite by chewing it up, and then swallowing it. But when thinking of an upcoming flight, it can be like trying to swallow a Big Mac whole. It is impossible to accurately simulate the experience of a two-hour flight by pondering it in a time span of two seconds; inevitably the experience of anticipating the flight will be inaccurate. If you sat down and conceived of the flight, moment by moment, spreading all the events over two hours, you can see how that would cause no stress at all. I’m trying to establish for you how inaccurate consideration of an upcoming flight can be, and how that inaccurate consideration can cause great (and inaccurate) stress. Do you make car payments or mortgage payments? What if you got a bill demanding that, instead of paying a monthly installment, you were told to pay the entire balance! That would be shocking. In an effort to determine ones readiness for a flight, when one tries to imagine what the flight will be like, inevitably the flight is compressed in time, and stress hormones are released which lead the person to believe the flight will be as stressful as is the time-compressed imagination of the flight. Reality — will not overwhelm you. Overwhelm takes place only when you imaginarily compress the events of several hours into the space of a few seconds. As the ‘Free Video’ says (take a look if you haven’t seen it at http://www.fearofflying.com), one drink won’t make you drunk. Nor will five drinks spaced out over several hours. But five drinks, one right after another, will overwhelm you. You simply need to understand that anticipatory anxiety is inescapable when you allow time compression to take place. Is there any way to avoid time compression and thus to make an accurate estimation of what you will feel on your upcoming flight? One way would involve setting a timer, and worrying about one thing only until the timer when off thirty minutes later, and then worry about a second thing, etc. That would give you an accurate way to estimate how you will feel when you fly. Or, you could set a timer, and then imagine just one single moment on your previous flight. And then, when the timer when off thirty minutes later, imagine one different single moment, etc. Then, simply do the 5-4-3-2-1 to dump the anxiety. 13. More On The Belief That Being Relaxed – Instead Of Being On Guard – Tempts Fate. Consider this from a client who said the audio course had done wonders for her DURING the flight, but that her anticipatory anxiety is “deep-rooted”. This is definitely a known problem. In fact, Freud wrote about it, and what he said is interesting. He said, the problem with trauma is, the first time you have one, since you never had one before, it comes as if “out of the blue”. Since it completely unexpected, and since it is something you didn’t even know existed, it hits you hard in two ways. One is, you feel you can’t handle it. You can’t just go through life knowing that at any moment, trauma could hit. What do you do? You EXPECT it. By expecting it, you are — sort of — ready for it. You are “braced” for it. The other way is also interesting: something happened that you didn’t even know existed. What does that tell you about the world? Can the world be trusted? Apparently not. What does that tell you about yourself? Can you be trusted to know how to live? Apparently not. So it sets up a massive insecurity. What do we do about it? Well, already we have decided to expect disaster at every turn. But is that the best we can do? What if we get scientific? Let’s consider cause and effect. Maybe if we can figure out what caused the trauma, we can find a way to keep it from happening again. The dogs next door are inside a radio controlled fence; the property has an antenna wire around it and if the dogs get too close, the radio on their collar triggers them to get an electrical shock. So they don’t run off the property. But they still chase cars. When a car starts to drive by, and of course, you and I know they car has no intention of stopping, the dogs race to the front of the property and start barking. The do this as the car is approaching, as the car is getting closer. So they get even more agitated. They bark more ferociously. By now the car is alongside the property. It keeps going. It is no longer getting closer. It looks like it is working. And yes, indeed, the car goes on up the road, keeps going farther and farther from the property as the dogs continue barking until the car had gone out of sight. They are proud. They chased the car away. It works every time. So does being anxious. What the dogs do makes perfect sense to them. And it makes perfect sense, in some way, to you, too. But why? Because though trauma does happen to children prior to the age of five, we don’t remember the facts surrounding the trauma. So it isn’t until about the age of five or six that we have that first trauma (it isn’t the first; it is just the first REMEMBERED trauma) and turn to the logic that a five-year has available to him or her, to try to deal with the problem. When we finally develop better logic (if we do), most of us don’t re-examine the strategy. One reason we don’t re-examine it is, it works. And now, even though you hear me say it is the logic of a five-year old, you are afraid NOT to use it. As you say, it is deep-rooted. But consider how and why it is deep-rooted. By using this strategy for years, you have made an extreme investment in the form of happiness relinquished in the interest of safety (or the illusion of safety). You have made a heroic and dedicated investment by maintaining a constant vigil. Barking at disaster has become your very identity. To give up the strategy would mean having to redefine who you are. You would have to begin to realize that you do not control disaster by staying anxious. You would have to realize that you are not a hero who has kept yourself safe through this self-sacrifice. It is not just your life that is at stake; your very identity — who you are — who you conceive of yourself as — is at stake. Even if giving up the strategy doesn’t cause a physical disaster, it threatens a psychological disaster: loss of self. If that doesn’t translate well, think of what we have heard that in some cultures, people cannot lose “face”. It’s the same thing. Your sense of self would be damaged, or so it appears, if you were to fully recognize that something you have stood for and dedicated yourself to is worthless. It is tempting to continue this identity. You can continue it. The dogs next door certainly will. But our dog has a different identity; she never chases cars. Why? Because she was never given an electric fence in which to run off her leash and chase away the threatening cars. When our dog goes out, she is with my wife, and is on a leash. My wife never showed the dog any fear of cars. My wife didn’t bark at them. My wife didn’t chase them away. So our dog, at this point, even if let off the leash would not chase the cars, nor even bark at them. The dogs next door are heroes who, every day, protect our neighbor from cars. They stand vigil. They are dedicated. And no car has ever dared to come upon the property and crash into our neighbor’s house. This of course makes perfect sense. And yet, it does not instantly change your emotional reaction to protecting yourself from disaster. It is so hard to give up something that has served you so well, though the service is 100% illusion. Or is it. Is there any time when expecting disaster has ACTUALLY saved you? If there is, if there has been even one time when expecting disaster has saved you, then maybe it is better to keep doing what you are doing. So, if there is just one time when you have saved yourself (or even believe you did), it will be all but impossible to change what you are doing. No matter how much you want to relax and be happy, as soon as you do, you become afraid that to be relaxed and happy will mean your death. It really is going to be important to decide if you want to take the chance. If you do, use the Strengthening Exercise. Put some cartoon character on a plane, and have them start to relax and start thinking nothing can go wrong. Then, have them become become alarmed that THEY HAVE CAUSED disaster. And similarly, put a cartoon character on a plane, and have them be completely relaxed. Then, have them become terrified that their being relaxed may cause a disaster. But also, put a cartoon character on the plane, and have them worry that by their being worried, it may telepathically be transmitted to the pilots and cause the pilots to make a terrible mistake. And then, put a cartoon character on the plane, and — upon relaaing — become alarmed and start worrying. And then, put a cartoon character on the plane and have them worry that their own independent worry is not sufficient. EVERYONE should worry. To avoid a disaster, other passengers need to be alarmed, so the cartoon character runs up and down the aisle screaming to everyone, “Worry, worry, worry, worry, worry, worry, worry”. In each case, take your focus immediately back to a soothing moment in which you felt the empathic connectedness with another person. I’m also reminded of a pilot I knew in the Air Force named Leo Thorsness. Leo was the cockiest guy I ever met. He was always up to a challenge of anyone about anything. The amazing thing was, Leo always won. If the challenge was an argument, he would always turn out to be right. If it involved sports, Leo always won. It wasn’t just that Leo was cocky; he earned the right to be. He was sent to Viet Nam where he flew F-105s on missions in which his plane was used as bait. He would allow his plane to be picked up on radar by a missile site; he would continue until the site launched a missile at him. As soon as the missile was launched, he would use the signal from the site which guided the missile at him to home in on the radar site, and fire a missile of his own at the radar site. The “game” was to get his missile to destroy the radar site before the radar site’s missile reached him. If he could destroy the radar site, then the radar site could no longer guide the missile and Leo would “win”, in other words, destroy the site and get to survive. If Leo “lost”, he would fail to get the radar site before the radar site’s missile got him. You can see some info on Leo if you search the web. Here a link about Leo’s appearance on a PBS program called “American Valor”. PBS did a program called “ American Valor” which included Leo’s story and an interview with him . Anyway, I heard that Leo had gotten shot down, and — since no one saw a parachute — it was believed he had died. It was odd that, somehow, I simply didn’t believe it. I guess it was because, in my experience, Leo always won. I had this irrational believe that “nobody could get Leo”. Six years later, I was watching television news of prisoners of war who had been released after the Viet Nam war was over. I saw Leo walking off the plane. At least, it is negative versus the Zen approach of “no mind”. Though a positive self image can take us far, it takes us only that far and then stops us. Why? Because, any self image, even a positive one uses up mental capacity. It is like having an unnecessary program running on your computer; it uses up RAM. In general, if you have more than enough RAM, or if you have more mental capacity than is needed for what you are doing, it doesn’t matter. It is only when you need all the mental capacity possible, that it matters. If, as you undertake something, you engage in positive thinking — or positive expectation — your reliance on the positive thinking can sabotage your success if you depend on the positive attitude to see you through. If you have already — painfully, perhaps — discovered that positive thinking doesn’t always work, that discovery may have led you to try the opposite: negative thinking. The point is, it isn’t necessary to expect things to go wrong to keep them from going wrong. Expectation — whether positive or negative — gets in the way. Expectations use up mental capacity that could be used to deal with what is at hand. People who perform at exceptional levels, like Leo, don’t get into expectations. Instead, they engage the present moment at the present moment. When it comes to flying, you can — wisely — trust the ability and focus and training of your pilot who, after all, is in the same boat as you are. He or she does not need your help in worrying. After all, he or she is getting paid to worry about the flight. Why should you do something you are not even getting paid to do? Young children are faced with many things they cannot control. When there is insufficient empathic connection with their parents, they feel insecure. To deal with this anxiety, they engage in “false control”. Instead of perceiving reality, they imagine things are the way they want them to be. Or, they pretend they are super-heros who have control. In addition to “what if”, there is a focus on “if only”. For example, “If only” I knew the SOAR Course would work. Or, “If only” I knew there would be no turbulence. When vividly entertained in the mind, both “what if” and “if only” cause stress hormone to be released, resulting in anticipatory anxiety.